One of my favorite things about holiday parties (second to having a reason to put on a sparkly dress of course) is indulging on holiday treats! Though I have a big sweet tooth, I’m just as big of a fan of savory snacks. I’d gladly take a variety of appetizers, charcuterie and small bites over a single main dish. 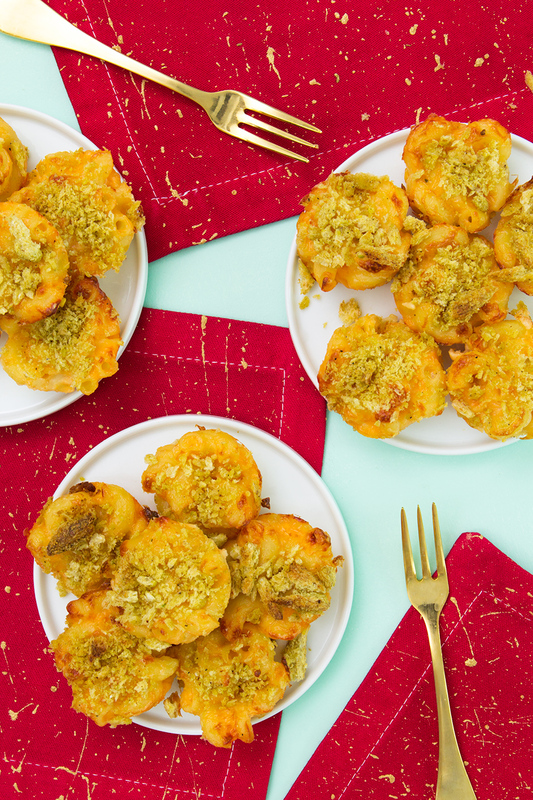 If you’re also a lover of apps or if you’re looking for a delicious finger food to serve this Christmas and New Year’s Eve, my baked mac and cheese bites are just the thing. It’s comfort food in one bite and these are sure to be a favorite among both kids and adults. Because who just doesn’t love classic mac and cheese, right? These bites get a little crunch (and a lot of flavor) when you top them with Harvest Snaps. Just crush up your favorite flavor, I used the Black Pepper Harvest Snaps which give them just the right amount of peppery kick. Preheat oven to 400°. Spray a mini muffin pan with cooking spray. Cut the corner off the top of a bag Harvest Snaps. Use your hands to crush the snaps until it resemble bread crumbs. Cook the elbow macaroni according to the directions on the package and set aside. In a medium pan, over medium heat, melt the butter. Then add the flour and whisk until combined and it thickens. Add the milk and keep whisking until the flour mixture is dissolved. Cook for 2-3 minutes or until the mixture thickens and coats the back of a spoon. Add the shredded cheddar cheese and cream cheese and stir until melted. Remove from the heat and add cooked macaroni and beaten egg. Stir until the sauce is evenly distributed then spoon the mac and cheese into prepared mini muffin tin. Top each cup with the crushed Harvest Snaps. Bake for 15 at 400° or until the tops are slightly golden. Remove from heat and let cool a few minutes before serving. They are best served warm but the mac and cheese can be made a head—leaving you more time to finish all that holiday shopping! Just hold off on baking them and keep the mini muffin pan full of mac and cheese in the freezer, covered. When you’re ready to bake, just remove them from the freezer and allow them to thaw at room temperature for about 10 minute then bake as normal. You can easily give some old cloth napkins you have laying around a big update! I used fabric dye and paint to create these festive, red and gold splatter cocktail napkins. They are perfect for the holidays and since they are fabric, they can be used year after year. Dye the napkins. Wash cloth napkins and leave damp. In a large metal or glass bowl, combine 4 cups of water with dye. Stir until the dye powder is dissolved then add the salt. Continue stirring until the salt is dissolved. Add more water (if dyeing more than 4 cocktail napkins). Carefully place the damp napkins in the bowl of dye and stir. Stir often for 15 minutes and then stir every so often for another 30 minutes. When dyeing fabric, it’s best to follow the directions on the label of the dye you’re using. If you’re using the one listed above, follow the steps below. Rinse. Rinse the napkins well to remove the dye then wash them separately in the washing machine, with a second rinse cycle. Dry on low and press with an iron to remove wrinkles. Now they are ready to be painted! Splatter paint. Use a large, corse paint brush to create the paint splatter look. Dip the brush in the gold fabric paint and cover it with a generous amount of paint. Hold the brush over the cloth napkin and use your other hand to quickly brush across the bristles and fling paint over the napkin. This can be very messy and it’s best to do this outside or in a large, well covered area. Dry completely. Once dry place them back in the dryer on one cycle to heat set the fabric ink and make them washable. This is the perfect way to give stained napkins new life! This super easy technique would look great in some many colors. Just choose your favorite holiday colors. These look and sound delish!!! And I love your DIY napkins, too…On my list to try ASAP! Always I love your jobs! Especially diy napkins inspiration project to me! ?